Fit and forget signage projector that can create a bright, scalable image up to 130 inches and delivers 20,000 hours’ reliable performance. 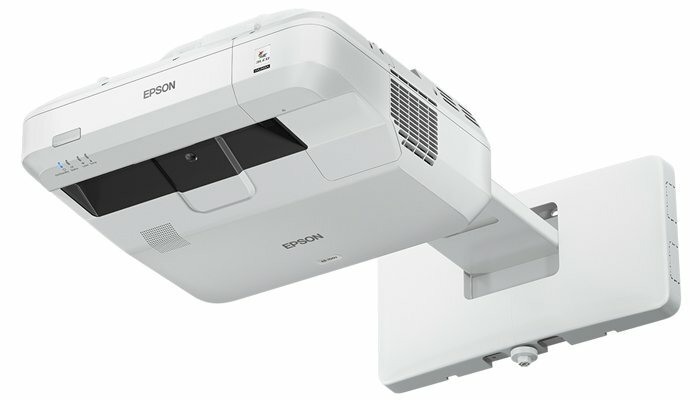 Epson’s first ultra-short throw laser signage projector offers a cheaper alternative to flatscreens for displaying high-quality Full-HD imagery at much larger sizes. This bright, powerful solution allows the projection of information or video exactly where they’re needed, while fit and forget reliability means it can be installed almost anywhere with no need for maintenance. A large image size of up to 130 inches combines with a bright, sharp 4,000-lumen WUXGA resolution to offer a great ultra-short-throw signage solution. It’s ideal for museums and galleries wanting to use striking projection as part of exhibits, or display visitor information that changes regularly. It’s equally useful for retailers wanting to display eye-catching information and advertising, and corporates looking for an ultra-short-throw meeting room solution. The EB-700U is an affordable display solution that that will work reliably with minimal regular maintenance. Thanks to laser technology there are no lamps to replace, and its inorganic panel and phosphor display wheel are so reliable that Epson offers an up to five-year/20,000-hour warranty. Compact and light enough to be installed by a single technician, the EB-700U offers the flexibility to fulfil the most exacting brief, and the versatility to work in narrow or awkward spaces. Its ultra-short-throw design enables projection of large images from a short distance, even in narrow areas such as shop windows, plus it can be rotated 360 degrees in any direction, and supports portrait projection.